The new G6 is to bring LG back into focus in the smartphone community. To accomplish this, the Korean company has given its top model some exciting features. The test will have to show if this is enough to break into the ranks of Samsung and Huawei. Times are not easy for LG. Apple, Samsung, and Huawei currently dominate the market. Manufacturers who were until recently unknown, predominantly from China, have been catching up quickly and also want to have a slice of the smartphone cake. LG also has the weight of last year’s top model, the G5 (test in connect 6/2016), lying heavily on its shoulders. It was not well-received by users. 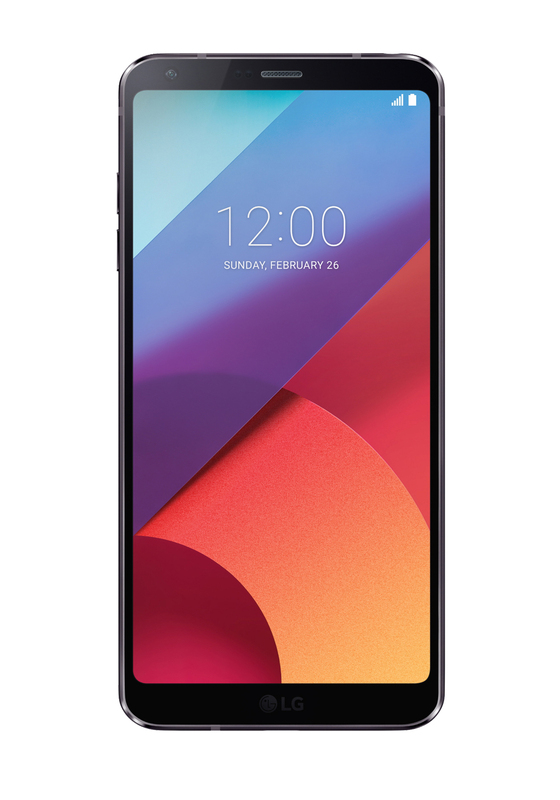 They need new ideas, so the G6 has gone for a screen with the unusual 18:9 format and a dual camera, thereby following Samsung’s S8 models and Huawei’s P range. The newcomer really knew how to impress in terms of presentation at this year’s MWC in Barcelona. The extensive lab test will confirm if the G6 can manage to make this turnaround. The Korean company is making an incredibly confident move with the recommended price: €749 for the G6 with all said and done. This is considerably more than Huawei’s P10 (€599) and only €50 less than Samsung’s Galaxy S8. But what you want and what you get are two different things. The RRP was already hot air upon launch, and you can get the G6 online now for around €600. In any event, the G6 does not have to hide away from the competition with its elegant look. It is also impressive across the board haptically thanks to its solid metal frame, which is angled slightly towards the user, as well as the scratch-resistant Gorilla Glass on the front and back. In addition, the glass on the back is smoothly rounded to let the G6 sit in your hand brilliantly. At 161 g it is hardly a lightweight, but the really compact size means it still fits in your trouser pocket. The on/off button is positioned on the back at the top and also houses the fingerprint sensor. This makes it ergonomically well-placed and it performed its service reliably in the test. A practical function is being able to tap twice on the touchscreen, which wakes the G6 from standby mode and lets you quickly check if you have messages without having to pick it up. The flawless and perfect finish is another top feature, but there is one annoying shortcoming: the back of the black test device was covered with ugly fingerprints after a few seconds. LG seems to have saved on an anti-fingerprint coating for the glass surface. Luckily, this effect was not as dramatic on the front. LG can make up for this blemish with special characteristics of the case. The G6 is protected against water and dust, meeting the IP68 standard, which means the smartphone can be submerged in a maximum of 1.5 m of water for up to 30 minutes. As usual, this only counts for clear fresh water and not salt water or a dive in the sink or bath water. The G6 has more to offer, because it underwent the 810G US military standard drop and shock test and achieved an above-average good result for a smartphone. We maintain that the LG is particularly shock resistant and should easily survive the odd bump in everyday use. Next to the fancy outfit, another absolute eye-catcher is, without doubt, the innovative display in 18:9 format. Even Samsung’s Galaxy S8 duo offer similar dimensions (18.5:9) and beam with a large screen despite the compact size. This now goes for the 5.7-inch LCD display of the G6, too. The resolution is beautiful with 1440 x 2880 pixels and looks very modern with its rounded edges, while also offering a fantastic image quality with great colours and crisp definition. Another special feature is that the G6 already supports modern standards like Dolby Vision and HDR10, which the streaming giants Amazong Prime Video and Netflix will offer in the future. This makes the G6 ideally prepared for the latest technologies. The basic figures of the exquisite LCD screen look right as well: the luminosity is very good with 482 cd/m2, while the contrast is easy to see even in different lighting conditions. With LTE Cat. 11, HSPA+, NFC, and ac Wi-Fi, the connectivity features have kept pace with the times. Unfortunately, the same cannot be said for the Snapdragon 82 Qualcomm processor, which keep up with the CPUs from Samsung and Huawei in terms of performance, but trails behind when it comes to energy management. There is a solid 4 GB of RAM, but the user storage cannot be expanded upon: 32 GB, of which only 21.9 GB is free. This is too little for a top-of-the-range smartphone. The versions for other countries sometimes offer 64 GB, a special digital/analogue converter for good sound, and support wireless charging. The G6 model sold in Germany offers none of this. Make of that what you will. The in-house UX user interface is impressive and covers the current Android 7.0. It has a modern and fresh look, and the customer can decide whether the screen shows the app menu or not. You can also select a simplified display with large icons and text if you wish. The Android soft keys can be customised in colour and order. The Google Assistant, the new teachable voice control, is also on board. Multi Window and Q Slide provide the G6 with two multitasking options, allowing two or more apps to be run parallel to one another on the XXL screen. Other goodies include the comfort view, which facilitates lower-fatigue reading thanks to the blue filter, the practical memo function QuickMemo+, the integrated FM radio, the fitness tracker LG Health, and the HD audio recorder, which offers comprehensive settings. Two lenses andcomprehensive features - the G6 has a lot to offer in terms of photo and video quality. Photo fans pay attention to these parameters: the G6 brings along two main cameras, which both shoot with 13 Megapixels. The duo are integrated into the back and provide one lens with a detection zone of 71 degrees and one wide-angle lens with 125 degrees. Both image sensors have a 1.12-micrometre single pixel and phase detection autofocus, which focuses really quickly. An optical and electrical image stabiliser should ensure wobble-free pictures in everyday use, while a double flash brightens up dark scenes. The picture quality of the main cameras is really high in good lighting conditions and delivers crisp and high-detail photos. Both cameras have some difficulty when there is little light, which quickly results in large areas of image noise mixing into the picture. The 5-megapixel front camera shows similar behaviour, which generally works at a considerably lower quality level. The camera interface is intuitive and clear and here you can swap between the to main cameras via two symbols in the top area. A swipe over the screen starts the front camera. You can use a button to choose between automatic and manual photo/video mode and a square image format. The latter allows you to see the camera image and the last photo simultaneously on the large screen, which lets social media fans check their photos straight away and post them. Under “Mode” you’ll find the typical default settings, like for panorama photos. There are two exciting points to discover in the settings menu: here you can activate the “Tracking focus” and “Film reel”. The second displays a small gallery view on the large screen with a practical scroll function. This lets you delete duplicate or poor photos immediately. Video fans get their money’s worth with the G6. Not only can they play with the slow-motion and time lapse mode and enjoy the maximum 4K resolution, but in manual mode they can also adjust the sound. The LG displays the level control for the stereo microphone and provides a limiter to prevent blasting. A filter removes low-frequency noises, while another eliminates wind noises. This lets nothing stand in the way of making Videos. LG puts its batteries through a strict quality control during manufacture. This puts the batteries under much more stress than required, which is commendable and deserves praise. Even the 3300-mAh battery of the G6, which charges particularly quickly thanks to Quick Charge 3.0, passed this security check. Unfortunately, the battery life in display mode is disappointing, reaching only 6:34 hours in the connect lab. This is below-average and potentially the price for using the not-so-fresh processor. The G6 was only able to partially impress with the other test results and did not really shine. The GSM reception is actually really poor, but luckily in practice this is no longer very relevant. For the most part, data and voice traffic runs via the UMTS and LTE networks. Overall, the G6 achieves the grade of “good”, but this is not enough to secure it a place in the top 10 of connect’s leader board. Nevertheless, the LG G6 has a divine display and good camera.